Bring your Affinity Designer designs into After Effects like a pro with these advanced time saving PSD tips. 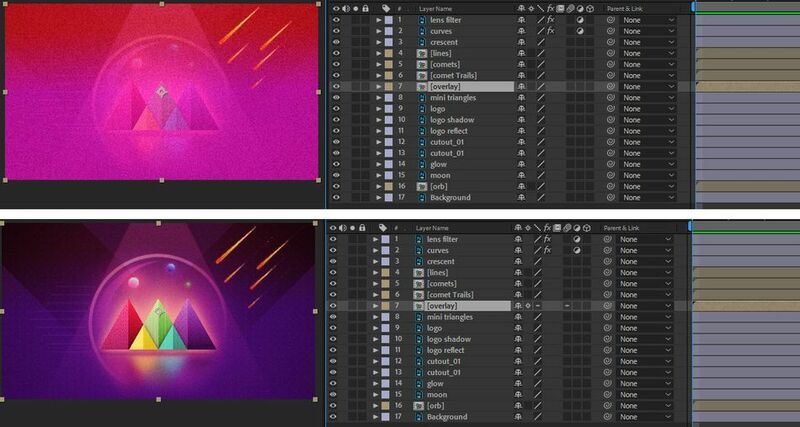 Now that you're hooked on using gradients, grain, and pixel based brushes in Affinity Designer, let’s look at advanced tips when exporting Photoshop (PSD) files from Afffinity Designer to use in After Effects. Put on your apron and let’s get cook’n. There are two locations in Affinity Designer to adjust the opacity of a layer. You can use the opacity slider in the color panel or set the opacity of the layer. The opacity slider for color will be ignored by After Effects. Therefore, only use the layer opacity. One exception to this rule is when gradients are created. When creating gradients with the gradient tool, the opacity slider for the color can be used without any negative side effects. Use the opacity value in the Layers panel not the slider in the Color Panel. 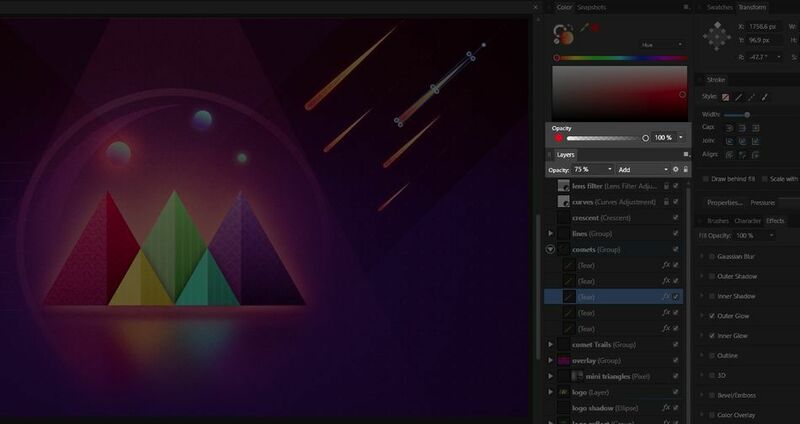 In Affinity Designer, each group/layer will become a composition inside of After Effects. So, when you start to get several groups/layers nested inside of one another, the precomposing in After Effects can get a bit deep. In projects with a large number of nested layers, the performance of After Effects can decrease. Left - Layers and Groups in Affinity. Right - Imported Affinity PSD in After Effects. You can consolidate groups/layers for elements that are made up of several groups/layers that will be animated as a single object inside of After Effects. To consolidate groups/layers into one layer inside of After Effects, select the group/layer of interest and click the check box in the Effects Panel for Gaussian Blur. Don’t actually add any blur to the group/layer, just clicking the checkbox will force Affinity Designer to make one layer out of the group/layer when exporting to a PSD file. Above - Logo in Affinity made up of five groups. Below - The logo is reduced to one layer in After Effects. When your main comp is composed of several precomps, the precomps are the dimensions of the main comp. Having small elements that have the same size bounding box as the main comp can be frustrating when animating. Note the bounding box is the same size as the comp for the comets. To trim all of your precomps at once to the dimensions of the precomp asset without affecting the layer’s position within the main comp use the script called “pt_CropPrecomps” from aescripts.com. Run it on your main comp to trim all of the precomps within the main comp. If you want the trimmed comps to be larger than the precomp assets, there are options to add a border as well. Above - Precomp is the same size as the main comp. Below - The precomp has been scaled to the precomp content. In the previous article the PSD preset “PSD (Final Cut Pro X)” was used. When using this preset, “Rasterize All Layers” is checked, which forces Affinity Designer to preserve accuracy of the layers. For more control in After Effects, the user can select different properties to preserve editability. Click on the “More” button in the Export Settings and uncheck “Rasterize all layers”. By unchecking the box, you have the option to preserve editability for specific element types. Let’s look at the options that apply to working in After Effects. Typically, gradients are best left to “Preserve Accuracy” since the gradients can’t be edited in After Effects. Also, in some cases, the gradients are not perfectly preserved during the transition between Affinity Designer and After Effects. In a moment we will take a look at a special case where changing the option to “Preserve Editability” will be beneficial. One of the great features that sets Affinity Designer apart from Illustrator are adjustment layers. Another degree of control comes from being able to export the adjustment layers inside of Affinity Designer directly to After Effects. The ability to tweak adjustment layers inside of After Effects helps the user make accommodations for changes that may come up. Left - Curves adjustment layer in Affinity Designer. Right - Curves imported to After Effects from Affinity Designer PSD. If you place adjustment layers or layers with transfer modes in a group/layer, be sure to turn on collapse transformations for the comp in After Effects. If you don’t, the adjustments layers and transfer modes will be ignored in the main comp, which can dramatically change the look of your artwork. Top - Imported Affinity Designer PSD with layers containing transfer modes in a precomp. Bottom - Same layer with the collapse transformation button checked. Just as Photoshop has layer styles, so does Affinity Designer. The layer styles can be preserved so that when you import your PSD from Affinity Designer they can be animated as native After Effects layer styles to provide more flexibility while working with your assets. 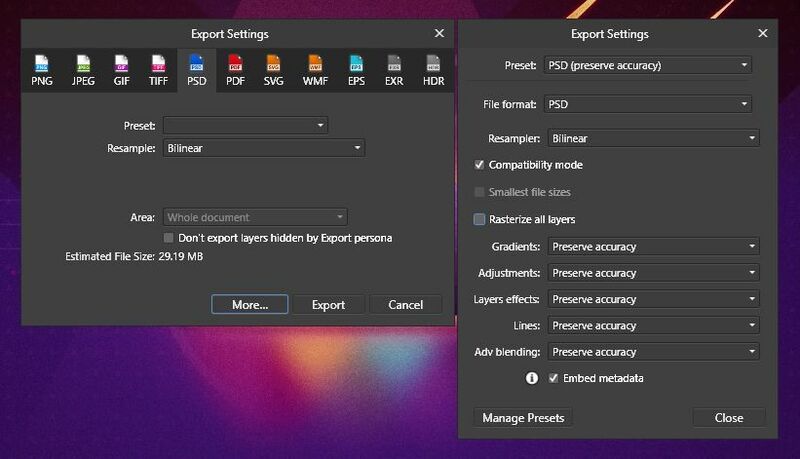 After Effects dialog box for PSD files. Layer styles preserved in After Effects when importing an Affinity Designer PSD. When applying layer styles, apply the styles to objects and not groups/layers. Layer styles that are applied to a group/layer will be ignored by After Effects since layer styles can’t be applied to compositions. An added bonus of preserving editability of layer effects is that you get an additional control in After Effects to control the fill strength of the layer, which allows you to adjust the opacity of the layer without affecting the opacity of the Layer Style. Adjust the fill opacity of layers that have layer styles applied to them. Making lines editable allows the user to have each object outlined by a mask. Therefore, you can create strokes in Affinity Designer and have them converted to masks in After Effects. With a little planning you can create masks for reveals and animating objects along a path while designing your assets. Note: If you have gradients applied to your artwork, you need to change gradients to preserve editability as well for masks to be generated. Lastly, don’t forget about the Export Persona that was mentioned earlier in the series. You don’t have to export all of your layers as PSD files. You may want to mix and match your export setting for a combination of raster and vector files. The workflow between Affinity Designer and After Effects isn’t perfect and at the end of the day Affinity Designer is another tool to bring your imagination to life. 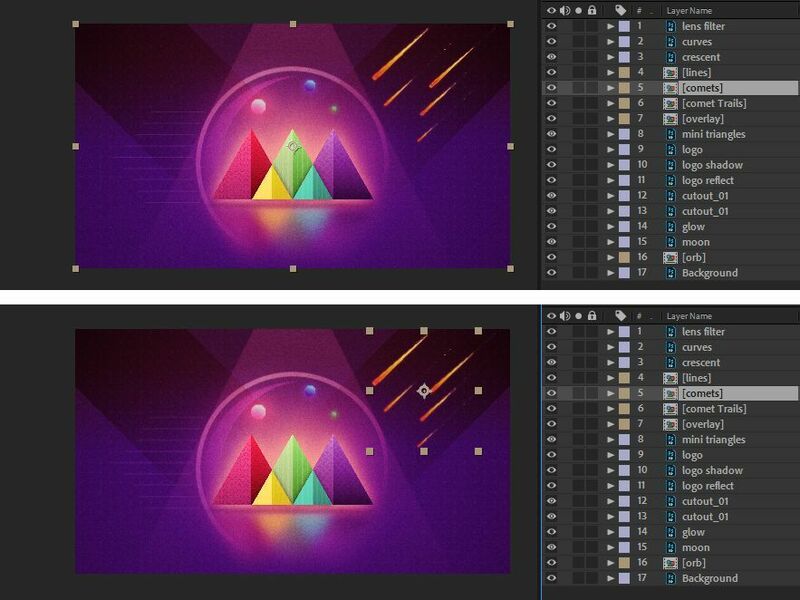 Hopefully, over time, the workflow for between Affinity Designer and After Effects will become more transparent. However, in the meantime, don’t let a few changes to your workflow make you miss out on giving Affinity Designer a shot for Motion Graphics work in After Effects. 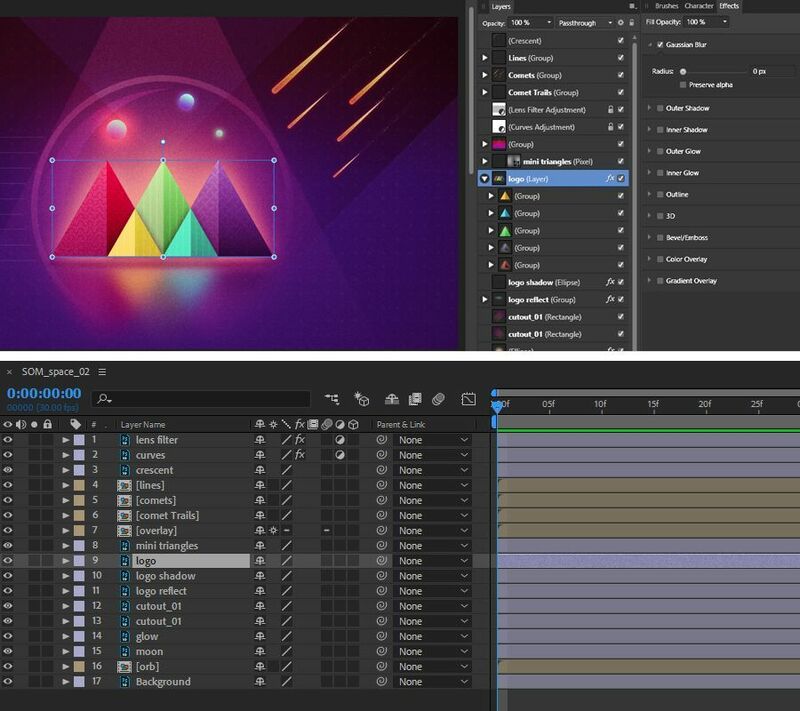 Want to see the entire Affinity Designer to After Effects series? Here are the remaining 4 articles on the workflow between Affinity Designer and After Effects.